The glossy ibis (Plegadis falcinellus) is a large wading bird with a very long bill that hangs out in marshes along the Atlantic coast (as well as in Europe, Asia, Africa and Australia). 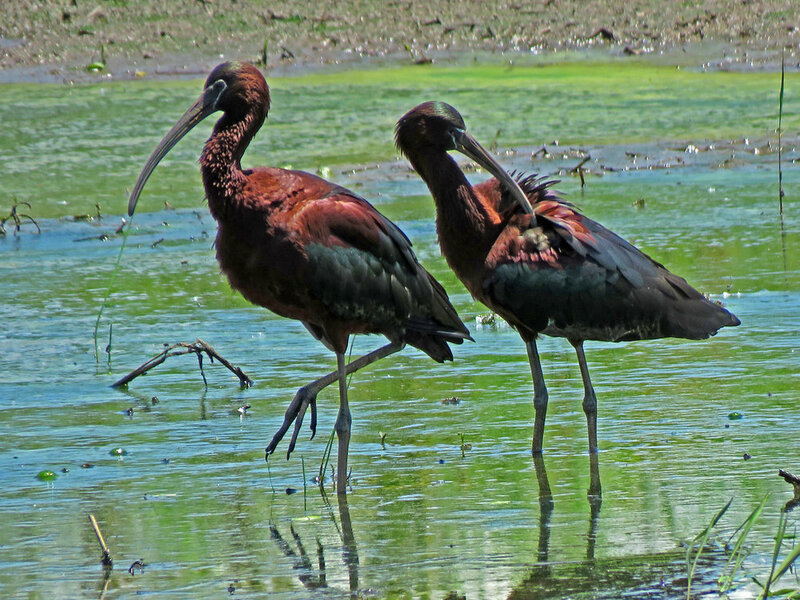 Glossy ibises eat aquatic invertebrates like bugs, crustaceans, worms, and they nest on the ground. The Filming the Feathers video shows glossy ibises seen June 2, 5, 19 and 20, 2018, at Jamaica Bay Wildlife Refuge and Broad Channel American Park in Queens, and at Mount Loretto Unique Area on Staten Island. The video is set to music by Charles Gounod (Petite Symphonie and Funeral March of a Marionette) and Georges Bizet (Carmen Suite No. 2), obtained from MusOpen.org, a royalty-free music source. The first photo below was taken at Broad Channel American Park in Queens on June 2, 2018. The second and third photos were taken at Mount Loretto on Staten Island on June 5, and the remaining photos taken at Mount Loretto on June 19, 2018.